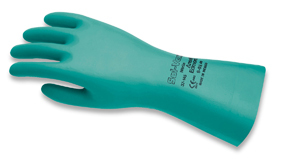 Ansell Edmont Sol-Vex 37-175 Reusable Nitrile Gloves are safe to be used in food processing. Ansell Edmont Sol-Vex 37-175 Reusable Nitrile Gloves are a combination of strength and chemical resistance, making it excellent for cleaning and food preparation. The thickness of the glove is 15 mil and length are 13 inches. Comes in size 8 & 9.